THERE IS NO BETTER RENTAL LOCATION AND FEATURES FOR LARGE FAMILY GATHERINGS. Nearly all of our guests are multi-generation families gathered to share indelible time together - please see our > 100 FIVE STAR REVIEWS. We take care of our guests! There are 8 bedrooms (sleeps 20) directly across the street from the beach with spectacular UNOBSTRUCTED GULF AND LAKE VIEWS. You will enjoy one of the largest pool/decks in all of Destin, a HUGE 37' x 16' private pool/spa directly on the lake with over 1,200 ft. of pool deck. 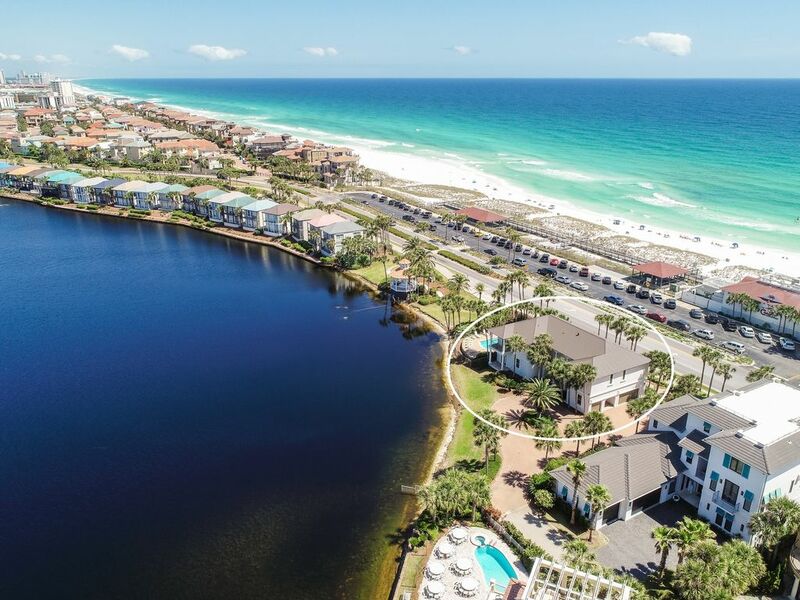 Our 4,300 square feet home with 1,000 feet of balconies/porches home is located directly on a spring-fed lake in a gated community on the largest lot in Destin (0.5 acre) with adjacent green space/park. You are directly across and steps away from the sugar white sands and emerald waters of Destin’s finest beaches (and the Crab Trap restaurant). NEW for 2019 - remodeled Chef's kitchen and wet bar with 48" Wolf range/double ovens, 64" fridge/freezer, new counter tops/cabinets/sink/backsplash. The house contains 3 king beds (two masters with jetted tubs, walk-in showers, and private balconies), 4 queen beds, 2 custom bunk bed sets (i.e., 4 twin beds), and a queen size sofa sleeper - please refer to the floor plans contained within the photos. There are two of everything at this home to make your stay more enjoyable and less stressful - two refrigerators, two front loading washer/dryer sets, two dishwashers, two master bedrooms, double oven, 55-60" TVs in the two large family rooms, and two master suites. LOTS of parking (8 or more cars). All smart TVs with free Netflix and Hulu. 'Destination Paradise” is located in the prestigious Destiny neighborhood that offers a large community pool, tennis court, and basketball. The neighborhood is gated, offering additional privacy and security for you and your family. We spend $35,000-$75,000 each and every year on improvements to enhance your experience - I challenge you to find another home that makes that annual commitment to upgrade and refresh. PLANNED FOR 2020 - outdoor kitchen/living area adjacent to the pool and new bathroom counter tops/sinks/faucets/painted cabinets. 1st Floor - perfect for the children and grandparents! We totally renovated, furnished, and operate this home. We are hands on owners. We keep our homes updated and are very attentive to detail, including a high cleanliness standard. We spend $35,000-$75,000 each and every year on improvements to enhance your experience - I challenge you to find another home that provides that. Take a look at our >100 guest comments - we take care of our guests! This is one of the most unique settings - very few places in the world can you be on a spring fed lake while also adjacent to a saltwater body of water. This home offers great views of both. This lot is the largest of any rental home in Destin and is also next to a large green space. Largest lot size of any rental home in Destin! Fabulous home! Very clean and well taken care of. We really enjoyed the pool and on the windy days, the community pool and hot tub. Walk to the beach was quick and easy. We rent many homes around the USA and this is one of the best! Great price for what you get. This property is very nice and well maintained. The location is excellent and very convenient for our needs. During our stay, there was a very minor issue with a motion detector, and it was addressed very quickly and efficiently by the maintenance man. Everything in the house was as advertised, the house was very clean upon our arrival. We are very happy to have stayed at this location. Our family of 15 stayed here the last week of February. The location of this house is perfect. We were able to walk across the street to the beach and the Crab Trap restaurant which has a wonderful outdoor bar right on the beach. The kids loved the heated pool. The house had a brand new high-end kitchen which was great as we cooked a few meals during our stay. Nick, the owner, was very responsive and was very flexible with us and we really appreciated that. Wonderful property! Would definitely stay again. My family and I spent our Thanskgiving holiday here. We had a group of 19 and the house was perfect. The location allows easy access to the beach, shops and restaurants. The home is beautifully decorated and well maintained. I will definitely stay here again in the future. The house is beautiful and recently remodeled. This was our 6th time staying at this home and we love it. Perfect fit for large family. We will definitely keep returning.